The eCourses in Sterile Compounding are CriticalPoint’s Flagship offering. First released in 2007, these eCourse have been continually updated to reflect best practices and the revision of the Chapter <797>. 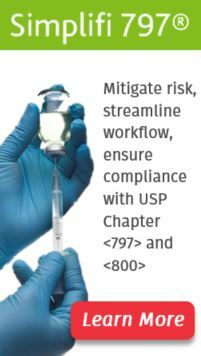 CriticalPoint has updated the Sterile Compounding eLearning curriculum to include new course material covering Chapter <800> along with new and revised content covering <797> . As part of this process, all content has been extensively revised with additional information, high resolution images and interactivity. The new format will create a far more engaging learning experience and we believe will result in improved knowledge transfer and performance change. 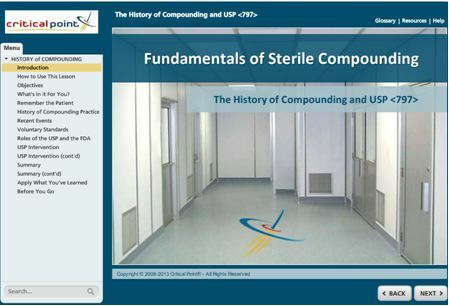 Click here to take the first lesson titled "The History of Compounding and USP <797>"
These 28 lessons (33 hours of ACPE-approved CE) cover all topic areas relevant to sterile compounding.